Today, if you have good, professionally produced video content, chances are you are monetizing it using pre-roll ads. At ScanScout, where we operate one of the largest instream video ad networks dedicated to helping publishers monetize their unsold video inventory, we have seen a lot of what has worked and what hasn't worked for publishers. We work with many large publishers to bring them pre-roll or overlay ads, and one of the most common mistakes we see publishers make is when they rely exclusively on pre-roll ads to monetize their inventory, they are invariably leaving money on the table. The typical video stream on a branded site will play out in this succession: users watch pre-roll, video 1, video 2, video 3, pre-roll, video 4, etc. 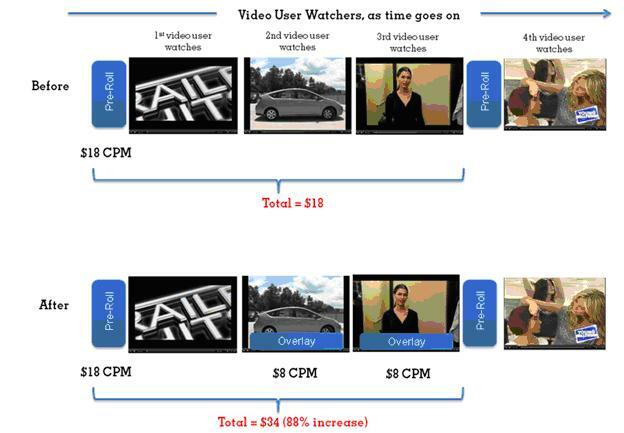 In this example, the publisher decides not to insert a pre-roll prior to video 2 and video 3 because of the fear of viewer drop off. The logic behind this is sound, but the end result is inefficiently monetized video content: videos 2 and 3 are failing to bring in any revenue while they still cost the publisher to stream the content. We have worked with publishers to get around this problem in the past few years. Instead of just relying on pre-rolls from ScanScout or their own sales force, publishers can run relevant overlay ads, such as agains videos 2 and/or 3. Overlay ads are contextually relevant and targeted to reach the right viewers (check out some samples here http://scanscout.com/ad_gallery.html). The end result is a significant increase in advertiser revenue while still retaining a user-friendly viewing experience. In this scenario, ScanScout actually helps publishers create a new "found" revenue stream by creating new overlay avails. These overlays, by IAB standards (yes, they are standard IAB units as of last year), will only appear on the video content for 15 seconds or less, after which they will disappear. ScanScout has further made it even more user-friendly by giving users an option to make the overlay disappear by clicking an "X" button on the top right corner o fthe ad if they desire. The CPM values above are purely hypothetical, but it is pretty obvious that regardless of what a publisher chargers, adding overlays to the video stream is going to increase revenue meaningfully. In this case, the publisher is nearly doubling its revenue. Obviously, one could go through various permutations of pre-roll and overlay ad placement with the content above to generate the best trade-off between monetization and user experience. Pre-roll is a great branding tool and one of the most engaging forms of digital advertising, but it should not be used by publishers as the only video ad unit. Doing so is a falure to fully capitalize on the revenue potential of online video. A smart mixture of pre-roll and overlay ads will not only bring in more dollars but also give viewers a more seamless viewing experience, allowing publishers to trade-off monetization and user experience with yet another tool. ScanScout is the most experienced company in the in-stream video ad industry and can guarantee 100% fill rate. We can do that because we have had the most experience in the overlay ad unit market and have built up a robust network of advertisers and partners. We have served more overlay ad impressions (7B impressions per year) as an ad network than anyone else in the world. Easy to integrate - ScanScout is pre-integrated with Brightcove. You can get our ads up and running immediately with no technical work on your part. Here's a link to the Brightcove demo unit and instructions http://demo.scanscout.com/customers/brightcove/. To get started, please contact publishers@scanscout.com to find out more about how ScanScout can help you get the most out of your online video content today.